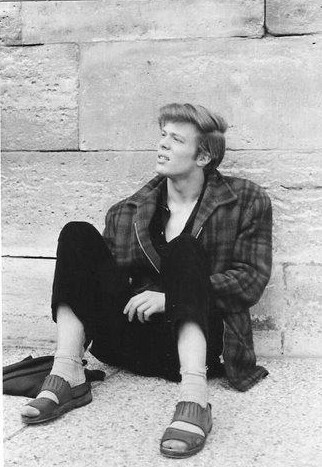 Michael in Paris, circa 1960. My friend and landlord of my first solo flat. I miss him dearly and think of him and his "Shakespearean" way every single day. Oh, how fondly I cherish the memories of our roof top cups of Earl Grey, and puffs of hash. I first got in touch with Sean McCormick after seeing this photo, and the dedication below it, on a general memorial website. Sean very kindly shared some memories with me. Michael Gothard was a family friend, whom Sean first met in London in June 1981, just after ‘For Your Eyes Only’ (in which Michael appeared as assassin Emile Locque) came out. They continued to meet and socialise until Sean moved back to New Mexico, late 1982, and Sean also rented a room from Michael in 1984/5, when he returned to London to work. … my dad and I earned our living on the streets with our Punch & Judy show, and it had taken us to London where my dad landed a job working for Jim Henson on ‘The Dark Crystal.’1 My mom was hired as a buyer and I started my apprenticeship. Dan2 once again got the bug to get out of the States, and he wanted to learn stain glass, so he decided to make his way to London. Before his arrival he gave us the name and phone number of an old friend of his from the Paris days; he was an actor, and maybe we could get together and network a little. My dad called the number, and we were invited to dinner with Michael and his wife. Their home was on Shirlock Rd., and only about a 20 minute walk from our Hampstead workshop. We rang the door bell, and waited, and waited, hearing thumping and bumping coming down the stairs. The door suddenly opened to reveal Michael standing there, inviting us in very graciously. I tugged my mom’s jacket, and said that he was the heavy in the new James Bond movie I had just seen, and we began the long climb to his flat on the top floor. There, we met his young wife4 M.T. : in my teenage eyes, one of the most beautiful women I had ever seen – and had a most wonderful evening and dinner. As the next month went by, we got together a couple of times for dinner, and I would run into them two or three times a week, having morning coffee at their favorite Hampstead hangouts while I was playing hookey from the school I went to. crust down for a bit; then he was funny beyond belief, and incredibly dedicated to his art. We began to eat and drink, laughing and telling jokes etc. For about an hour we were the only people down there. Then the pub across the road closed, and the place got really busy, and they seated three very drunk and loud couples at one table. Within seconds, the three women shrieked in laughter and started back up the wooden stairs they had just come down, making a racket with their high heels. After a few minutes of commenting on how rude this group was, Michael went back to his story, and – at almost the same point in the story – the women started back down the stairs from the restrooms, making more noise than when they left. Again, Michael really started getting pissed. M.T. was telling him to just blow it off, they were drunk, and to let it go, then on the fourth and final outburst from the group, Michael spun in his chair so he was looking right at them, and, in this booming Shakespearean voice, says, "Aren't we the noisy one then!" Not another peep was heard from that table for the rest of the evening, and a hush fell over the place that is probably still there. He didn't trust the Government on either side. He was a CND marcher and supporter. He'd have a pint but loved wine, coffee, and Earl Grey, Brie, Port and Stilton, and good cheddar. I would tease him, telling him that he only liked the stuff that tasted like old socks. He also loved Italian food most of all. He loved driving his Rover and was Best of British top to bottom. Q: Do you know whether he had any interest in football, and if he supported a particular team? I'm imagining as a North London boy, it would have been either Arsenal or Tottenham Hotspur (Spurs). Sean: If memory serves, he did, and you’re correct –Tottenham. Q: Did he have any particular religious beliefs? Sean: I'm pretty sure he was of the atheistic belief. Q: Did it bother Michael that he was so often cast as a villain, or was he just glad to have the work? Sean: Yes, he was very worried about the type-casting. Q: Did he have any favourite TV programmes? Sean: I don't recall him watching much TV at all. He read "Private Eye" faithfully, and the Evening Standard. Q: What kind of music was he into? I know he liked jazz, but was there a particular kind he preferred? Sean: Music-wise he liked the dark side, Miles Davis, John Coltrane, Monk etc. Q: Did he have any pets? Q: Did he do anything to keep fit? Sean: He did like to go for walks on the Heath11 but that was it. He drove everywhere. Q: Did he do much or any stage-work in between film and TV? Sean: I don't think he did much stage work, although I could be wrong. Q: What did Michael consider his best work? Sean: I think he thought that his best work was the Three Musketeers,12 or at least it was the best film he had done. Q: Did he ever talk about his early life, or why he left home so young (for those times)? Were they well-off? And do you know whether his father was Jewish? Sean: No. He never really talked too much about his parents, but I'm sure they were working folk. Not sure if they were Jewish. He would go into these almost Yiddish expletives sometimes in a reference regarding a slow restaurant or in the telling of a joke. Q: Can you remember him playing an instrument? Sean: I think he had a piano all the way up at the top of the house. I don't recall him ever playing it. 1 Pre-production on ‘The Dark Crystal’ commenced in July 1979, and the film was released December 17, 1982. 3 ‘For your Eyes Only’ came out on 24 June 1981. 4 No record has been found of Michael and M.T’s marriage. She briefly appears in a scene of "For Your Eyes Only” shot in Cortina, so they may have been married abroad. However, it also seems possible that Sean just assumed they were married, and – when they split up – that it was a divorce. 5 The basement is no longer used for the public. 6 ‘pissed’ in the American sense: annoyed. 7 However, according to both Gerry Cullen and former girlfriend N.B., Michael preferred to avoid conflict. I asked Sean whether he ever actually saw Michael take someone on. Sean said, "No, but you kinda always thought maybe today was going to be the day, anytime you did go out." It seems possible that what Sean interpreted as readiness to fight, was actually just vigilance. See N.B. 's account under the heading: "Michael's past." 8 Both on Roslyn Hill, Hampstead, London NW3, which was about 10 minutes from his home. The Coffee Cup is still there, though under new management. Farquharsons is no more. 9 The Valley (Obscured by Clouds). 10 Per former girlfriend N.B., Michael had a ginger tom cat called Oscar, and also used to feed a visiting stray. 11 Hampstead Heath, which was less than five minutes from his home.